The model number and version of the valve is found on a label on the outside of the valve cover. The digital six-port valve can be air tested up to 100 psi (689 kPa). Before testing, install the jumper wire to open the solenoid ports. The air test begins at the hot and cold inlets of the valve. The K-923 Laminar bath spout is compatible with the six-port digital valve. Refer to the spout specification sheet for more information. The part number and revision level for the DTV 1 user interface is found on a label on the back of the interface. 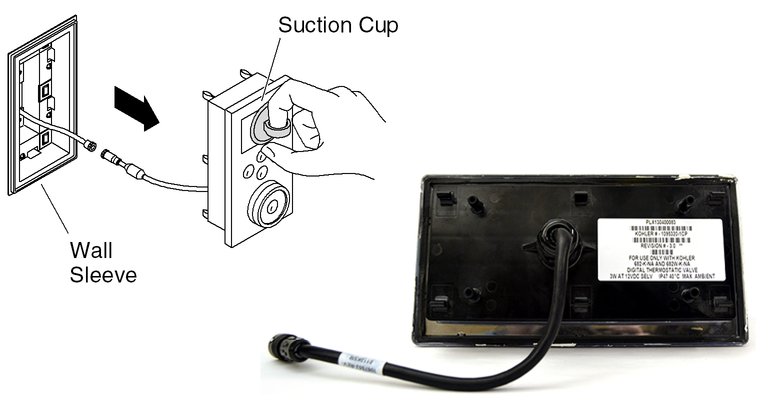 To access the back of the interface, use a suction cup (part #69944) to pull the interface out of the wall sleeve. The three versions of the DTV I user interfaces are 1.0, 2.0, and 3.0. For the system using both a primary and auxiliary interface, they must be the same version. To find the version code, turn the dial on the interface and navigate to Settings > Valve > Version. The DTV II system is controlled by the K-638 media module. System components such as the six-port valve, lighting, and other options are connected to specific ports on the media module using cables. In the context of building code, the plastic casings of the K-682 digital valve and K-638 media module are combustible. These products must be installed in accessible locations for servicing. The system components are rated for flammability and meet UL requirements, however they are not plenum rated. The media module can be connected to a switch. If the switch is plugged into a router via a LAN port, and the switch is managed, then the router can assign an IP address to a device connected to the switch. The DTV II system provides a high voltage dimmable lighting output for direct connection to incandescent lighting. The maximum wattage the media module can support is 250 Watts, including incandescent lighting. A ThermaSol MR16 lighting fixture cannot be used with the DTV II system because the fixture is driven by a transformer. A music player can be connected directly to a DTV II system by attaching an RCA audio cable to the "audio line in" port on the media module. To connect an iPod or MP3 player, you may need a 1/8" stereo to dual phono (RCA) plug Y-cable and a phono coupler.